National Geographic's Trails Illustrated map of Walden and Gould combines unmatched detail with helpful information to offer an invaluable tool for making the most of your travels in North Park and the surrounding areas. Expertly researched and created in partnership with local land management agencies, this map features key points of interest including Arapaho National Wildlife Refuge; Case Flats; State Forest State Park; Delaney Butte Lakes, Owl Mountain, Brownlee, Verner, and Manville state wildlife areas; Walden and McFarlane reservoirs; and portions of the North Platte, Illinois, and Michigan rivers. 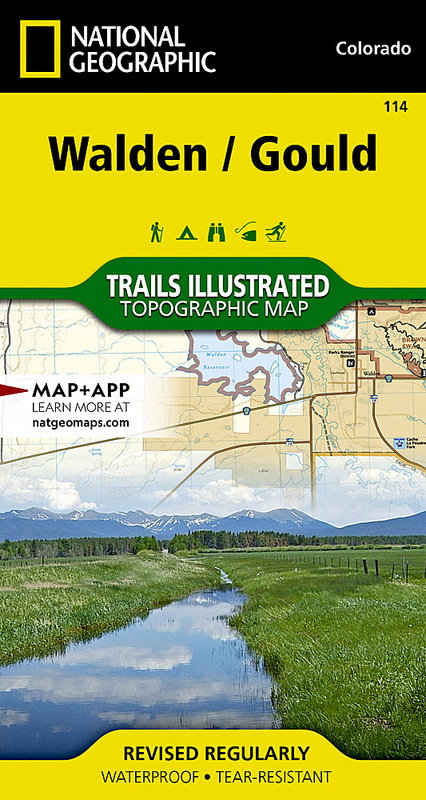 Like all Trails Illustrated maps, this map features detailed topography with shaded relief, elevations, and clearly defined, color-coded boundaries for parks, forests, public lands, wilderness areas, and wildlife management areas. Road types are differentiated, so you know if the route you choose is a paved, four-wheel-drive, or high-clearance road. Trail use is easy to identify, whether you're hiking, biking, snowmobiling, or cross country skiing. The Case Auto Tour and Cache La Poudre � North Park Scenic Byways are noted for those wishing to take in the scenery by car. Recreation features are clearly marked, including campgrounds, trailheads, fishing areas, boat launches, interpretive trails, and yurts. Other features found on this map include: Routt National Forest.